Australian researchers have developed a CatBib which is a colorful bib that is supposed to deter a cat from hunting wildlife. A study conducted with cats wearing CatBibs showed that the CatBib prevented 81% of cats from catching birds, 45% from catching mammals, and 33% from frogs and reptiles. If I had to wear that thing around, I’d never leave the house to begin with. 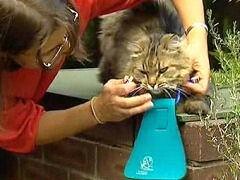 The bib attaches to the cat’s collar and researchers say that cats quickly adapt to the bib. There is still speculation if the CatBib works because it prevents the cat from pouncing on other animals properly or if the bright colors warn other wildlife. Either way, I’m sure your cat is just going to absolutely love wearing a bib around his neck. This entry was posted on Friday, June 1st, 2007 at 9:00 am	and is filed under Pet Food Recalls & Safety, Cats, National Dog, Cat & Pet Info, Products & Services for Cats & Dogs. You can follow any responses to this entry through the RSS 2.0 feed. Both comments and pings are currently closed. i’d give my cat about 30 seconds before she’d either managed to yank the bib off or break her own neck in the process. Conceptually - great idea. Save a bird, i’m all for it. But just look at the poor test subject in the photo - like amys just said, that thing is coming off as soon as that person backs away. haha..
My cat won’t even wear a collar. I put the safety collar on him. In case he gets caught he can get out of it. He always rips the collar off. One morning I had my bedroom door shut with the kitty locked out of the room. Last I knew the kitty was wearing the collar. Then I see his little paw pushing the collar under the door. He pushed the collar into the bedroom from behind the closed door. I got a good laugh out of that!!! That is like him saying, here is your stupid collar, you cannot out smart me. Pleeeeease Don’t Make Me Wear This Thing, nooooooo!!! It looks so big that the cat would trip over it . It also looks like it would be dragging on the ground. Hopefully it has safety elastic on the neck? If so, yes they will definitely get out of it. If not, cat will get hung on something. My cat occasionally puts a leg through his safety collar then walks around like he’s maimed until I rescue him. I don’t let mine run loose, but I keep him collared because he’s an escape artist & manages to shoot out the door every so often. The bib looks like it will make a cat more visible to predators & less able to get away or climb trees. Solution? Keep your cats confined in some way! Mine go into the fenced dog pen that has barriers at the top that they can’t climb over. Maybe they can put these on those Florida feral cats that are eating marsh rabbits–any volunteers? There is an easy answer to the problem. Keep your cat inside!! I agree with Wendy44! Save the birds and assure your cat a longer life by being an inside kitty!! I agree with keeping the cat inside. That collar looks dangerous and could get hung up on something. Too many hazzards outside. how it works is you have gotta be thinking like the prey. “holy cow what the heck is that thing hanging from your neck there Cat?” as they fly off in terror of the weird thing. yah, right. not my cat. too cute. Whoever thought this up obviously does not like cats. what if it gets caught in something and strangles the cat? how many birds does a domestic cat really kill anyway? probably only the little or sick ones at that because last time i checked my cats cannot fly. i have 2 caged cockatiels and not once have any of my cats harmed them. i used to have a hand tamed cockatiel who flew around the apartment while the cats just stayed out of their way- those damn beaks are sharp. people who are concerned about song birds should just keep their cats in the house. in all my years of cat owning including outdoor cats in the country we always had bird feeders full of chirping alive birds,a yard full of chickens and cats who only brought home dead rodents. and frankly that’s what you want them to do on the farm thank you and the dog can please get the snake thank you-works for me. Who cares if the cat catches birds and mice? What if the cat was raised wearing that thing and then ran away? How would it survive?